In his State of the Union speech, Donald Trump predictably made a number of controversial, inaccurate statements. However, one which caught many people off-guard was his comment that America would never be a socialist nation. Trump has a poor record of stating the facts, but his comments ignore that the U.S. is already socialist, as least in terms of supporting is major corporations. 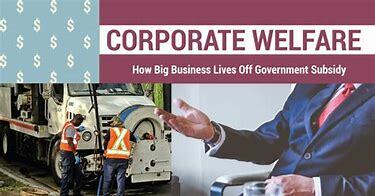 Over the past 15 years, about $68 billion in taxpayer money has been given to corporations. This huge sum comes in the form of subsidies, tax credit and grants, most of which will never be repaid. This money is going to the largest publicly-traded corporations in the U.S., most of which are household names. So when Trump says the U.S. will never be socialist, he ignores that in a free market economy, corporations should sink or swim based on their own merits and market forces. Laissez-faire and all that. But in a monopoly capitalist state, subsidies are being freely distributed in the form of grants, targeted tax credits, loans and loan guarantees. This practice has been going on for decades, but apparently Trump’s speechwriters forgot to ask Congress, industry lobbyists, and World Bank about these entrenched practices. Now, it is no secret that America’s largest corporations take money from customers, banks and investors. But why do they need federal money? The reason is: they can. Just like corporations that engage in share buybacks, using the cover story that they will reinvest that new capital in employees and productivity enhancements, the real story is that share buybacks boost corporate executive compensation at the expense of productivity and profit gains. (See the article, Share Buybacks Used To Be Illegal on this site). Yet, when it comes to taking federal money, America’s largest corporations are not ashamed. A federal handout is always welcome and it is even better when it does not have to be repaid to U.S. taxpayers or when the tax obligation is reduced because of some tax loophole. Here are some specifics courtesy of the site Good Jobs First and their impressive report, Uncle Sam’s Favorite Corporations (March 2015). This group has produced a great report written by Philip Mattera and Kasia Tarczynska. They provide a great analysis of this twisted situation. Here are some key excerpts from the report’s Executive Summary. “Six parent companies have received $1 billion or more in federal grants and allocated tax credits (those awarded to specific companies) since 2000; 21 have received $500 million or more; and 98 have received $100 million or more. A group of 582 large companies account for 67 percent of the $68 billion total. “The largest recipient of grants and allocated tax credits is the Spanish energy company Iberdrola, which acquired them by investing heavily in U.S. power generation facilities, including wind farms that have made use of a renewable energy provision of the 2009 Recovery Act providing cash payments in lieu of tax credits. Iberdrola’s subsidy total is $2.2 billion. “Other top grant/ allocated tax credit recipients include NextEra Energy (parent of Florida Power & Light), NRG Energy, Southern Company, Summit Power and SCS Energy, each with more than $1 billion. The results exclude the numerous corporate tax breaks that cannot be attributed to individual companies. Mainly driven by the massive programs launched by the Federal Reserve in 2008 to buy up toxic securities and provide liquidity in the wake of the financial meltdown, the totals for loans, loan guarantees and bailout assistance run into the trillions of dollars. 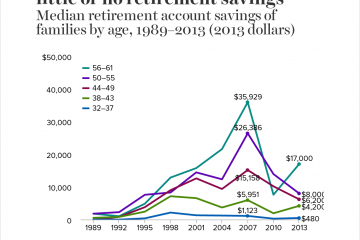 These include numerous short-term rollover loans, so the actual amounts outstanding at any given time, which are not readily available, were substantially lower but likely amounted to hundreds of billions of dollars. Since most of these loans were repaid, and in some cases the government made a profit on the lending, we tally the loan and bailout amounts separately from grants and allocated tax credits. “The biggest aggregate bailout recipient is Bank of America, whose gross borrowing (excluding repayments) is just under $3.5 trillion (including the amounts for its Merrill Lynch and Countrywide Financial acquisitions). Three other banks are in the trillion-dollar club: Citigroup ($2.6 trillion), Morgan Stanley ($2.1 trillion) and JPMorgan Chase ($1.3 trillion, including Bear Stearns and Washington Mutual). A dozen U.S. and foreign banks account for 78 percent of total face value of loans, loan guarantees and bailout assistance. 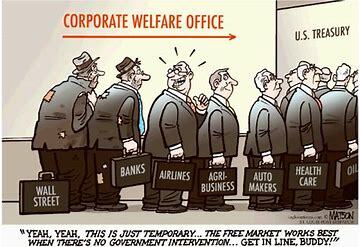 “A small number of companies have obtained large subsidies at all levels of government. Eleven parent companies among the 50 largest recipients of federal grants and allocated tax credits are also among the top 50 recipients of state and local subsidies. Six of the 50 largest recipients of federal loans, loan guarantees and bailout assistance are also on that state/local list. Five companies appear on both federal lists and the state/local list: Boeing, Ford Motor, General Electric, General Motors and JPMorgan Chase. “Foreign direct investment accounts for a substantial portion of subsidies. Ten of the 50 parent companies receiving the most in federal grants and allocated tax credits are foreign-based; most of their subsidies were linked to their energy facilities in the United States. “The Federal Reserve aided a large number of foreign companies in its efforts to stabilize banks that had acquired toxic securities originating mainly in the United States. Thanks largely to those programs, 27 of the 50 biggest recipients of federal loan guarantees and bailout assistance were foreign banks and other financial companies, including Barclays with $943 billion, Royal Bank of Scotland with $652 billion and Credit Suisse with $532 billion. In all cases these amounts involve rollover loans and exclude repayments. Trump’s slur against socialism and progressivism are just more symbols of hate from Trump’s party. Like the border wall, Mexican gangs, crimes by illegals, immigrant caravans, rampant crime in big cities, late-term abortions and the dangers of Iran and Venezuela, Trump’s vilification of socialism, is another diversion. Instead, socialism should be recognized as a range of systems that involve forms of social ownership of economic producing entities. That’s a mouthful and certainly has no place in a political speech. But the audience knows something is amiss. 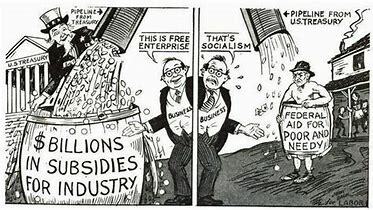 The economy is not producing benefits for all, as capitalism promises. Instead, it may be time to adopt a new outlook, one that requires organizational change in response to today’s economic reality. That organizational change may look like “socialism” to some, but it really is just a more accurate view of dealing with today’s dismal economic facts of huge wealth disparities and wage stagnation.